With the legendary strength and grit of a SKILSAW, this lean, mean chop saw for metal is a powerful ally to have in your corner. Our 14 inch Abrasive Chop Saw weighs in at 33.9 lbs., so it goes from truck to jobsite and back without adding strain to your day. But being light doesn't mean it's any less tough. Designed with stability in mind, the large 11 x 18-1/2 inch base makes sure that this machine stands its ground through whatever you throw at it. The versatile "D" handle gives you comfort and control cut after cut. From the name generations of pros already know, the 14 inch SKILSAW Abrasive Chop Saw has your back. Lightest weight chop saw at 34 lbs. Featuring the innovative Quick-Change Wheel Release technology, the DeWalt 14-inch Cut-Off Saw provides power and overload capacity to maintain performance and durability on the industrial jobsite. It has an extra-wide, solid steel base that offers stability when cutting longer materials and it includes a 6 ft. cord for extended reach capabilities. The BT8005 14 inch-15A chop saw cuts materials up to 4-1/2 inch and with the correct blade, can be used to cut conduit, ABS, copper pipe, tile and even concrete. With a safety interlock trigger, Heavy duty base, vise clamp assembly with quick release, comfortable horizontal "D" handle with hold-down lock button, plus carry handle, this is the go to chop saw for portability, power and safety.General International 14-inch chop saw has a 15-amp, 3,500 rpm motor that's ready to assist on any cutting job, including cutting cast iron pipe, angle iron, threaded rod, conduit, square tubing, and much more. 15 Amp Corded 14 inch Abrasive Chop Saw with Carbide Blade With the legendary strength and grit of a SKILSAW, this lean, mean chop saw for metal is a powerful ally to have in your corner. Our 14 inch Abrasive Chop Saw weighs in at 33.9 lbs., so it goes from truck to jobsite and back without adding strain to your day. But being light doesn't mean it's any less tough. Designed with stability in mind, the large 11 x 18-1/2 inch base makes sure that this machine stands its ground through whatever you throw at it. The versatile "D" handle gives you comfort and control cut after cut. From the name generations of pros already know, the 14 inch SKILSAW Abrasive Chop Saw has your back. 15 Amp Corded 14 inch Abrasive Chop Saw with Carbide Blade is rated 4.3 out of 5 by 8. Rated 5 out of 5 by Nathan from Nice saw for the price, would recommend.... Nice saw for the price, would recommend. Rated 1 out of 5 by timby50 from Couldn’t make a straight cut. Taking it back. ... Couldn’t make a straight cut. Taking it back. Rated 5 out of 5 by Neil from Great performance! I am happy with this product. Have cut through a load of steel and haven't had any issues. Rated 5 out of 5 by HomeDepotCustomer from Cuts concrete landscaping blocks very well, but use a diamond... Cuts concrete landscaping blocks very well, but use a diamond blade. Rated 5 out of 5 by TECHHEAD from SPT64MT4 – Let the sparks fly FIRST IMPRESSIONS: Well packaged in the box. Not sure if the missing rubber foot is intentional or not? The one right below the spark deflector is missing. Maybe they found that the sparks were burning it?? Non impacting to the flawless operation of the saw. This saw weighs in at 36.1 lbs but with the carry handle on top, it’s very easy to lug around. The stamped steel base is a big improvement over other cast metal bases. The blade that comes on the saw is for metal studs. This saw is competitively priced and very affordable. The lock pin is great and a big improvement over the chain hold downs of other chop saws. The ergonomic D-handle is easy to grip and is easy to use to lower the blade using either left or right hand. Initial start up of the 15A motor is nice and smooth, quick rev up to speed and comes to a stop in under 15 seconds. OPERATION: Let the sparks fly, cuts as expected for an abrasive chop saw. The spark guard takes the brunt of the cast off. The metal being cut has some burrs but not more than there is to be expected. No problem cutting various types and thicknesses (up to ¼”) of metal, round, square tubing, angle iron, even 6061 aluminum angle, some burrs left behind but easily cleaned up with a file or angle grinder. Blade changes are made simple with the locking leaver (not a push in button) and the supplied allen wrench, which is also used to adjust the vise to cut up to +/- 45-degree miter cuts. Changed out the blade for one that would cut steel/stainless steel to cut the heavier metal tubes and angle iron. This is one abrasive chop saw that I would recommend to any of my friends that work with metal on a daily or weekend basis. Rated 3 out of 5 by DanW from Kinda boring I was quite exciting seeing the box on the porch. After hurriedly opening it I was dissoppointed to find it was the wrong tool. After getting over that disoppointment I gave the saw a fare chance and I also found the saw to be packaged very well, and like Matthew R, mine was missing one of the rubber feet. The handle on top does make it a lot easier to transport, and I really liked the D handle. It is comfortable and made it easy to use with either hand. The first thing I cut was a structural 2x6 stud. The saw cut unexpectedly cleanly. Meaning there was less of a burr than I have had with other saws. I was shocked to see there was a chip in the "blade" after that cut though. I made several other cut all with similar results, and the chip didn't seam to cause any excessive vibration. The motor never bogged down, even while cutting a 3/4" piece of m2 tool steel hardened to around 52 Rockwell. All these good features still didn't impress however. The clamp seams like all the other saws on the market, and you need a wrench to adjust the fence to cut on a mitre, which I found inconvinient. The chip guard does keep the chips from flying behind the saw, but they are just deflected to the sides. Overall it is a good way to cut metal for an affordable cost, but nothing jumps out as exceptional. Rated 5 out of 5 by Matthew R from Could not have ask for anything better!!!! SkilSaw 14” Abrasive Saw After receiving my saw I hurriedly opened the box. It was packaged very well and was not hard to open and get everything setup to start cutting. I did notice that I was missing one of the rubber feet (which I am sure Skilsaw will replace), but otherwise I was ready to go. It is heavier than my old abrasive saw but is more mobile and easier to carry because of the handle on top. The handle is different which but is like my miter saw so it will not be an issue. There was plenty of power, nothing I put in front of it bogged it down, which was not the case for my previous saw. I cut a handful of different types of metal from square tubing, electrical conduit, angle iron, metal t-post, and a few other random metal objects. It made smoother and cleaner cuts than I was expecting it to make, which will lead to work getting down quicker and looking better. The vise for holding down the material was very well built and smooth, and making the area smaller and larger was a breeze. 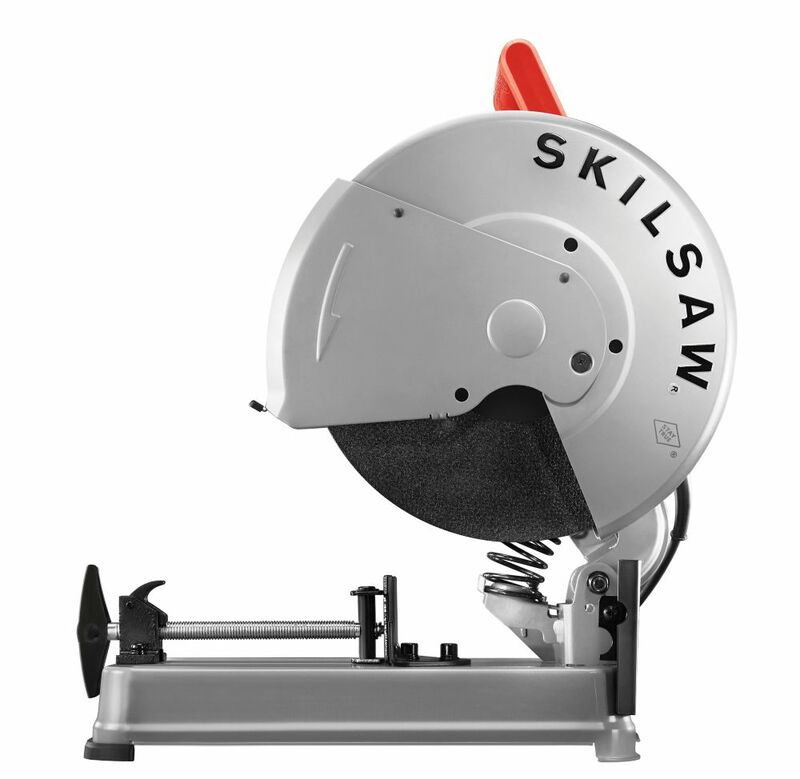 I would definitely recommend this saw to a friend, it is priced very well and from what I can tell is a great saw that should last for a longtime .